Hyderabad is a city loaded with famous monuments and exciting things to do but most of all it is a destination that delights the satiates the foodie inside you! Best restaurants in Hyderabad have been listed for you to choose the one that best fits your taste. 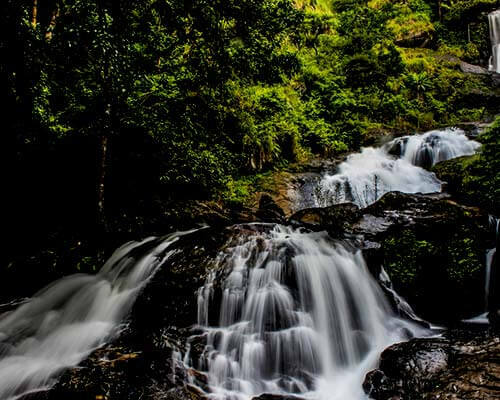 So while you are at exploring the historical sites and monuments of the city, we lay down the top restaurants, diners, and cafes in the city of Hyderabad to make your search for delicious meals easy and accessible. 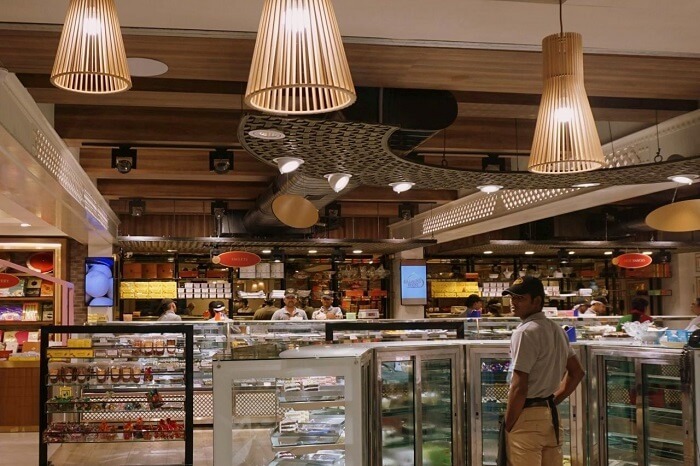 From lavish diners to cheap eats, from traditional cafes to modern bakeries, from barbecues to biryanis, here are the top 20 restaurants in the magnificent city of Hyderabad that can turn anyone into a foodie! This is one of the best restaurants in Hyderabad that serves the famous ‘wish grill’. It’s fun ambience and quick service makes it a jam-packed restaurant, so making prior reservations would be a prudent choice. It has two outlets in the city, equally good, so you can choose from the one nearest you. The diners particularly appraise the ambience of the restaurant that is suitable for friends and family alike. Looking for a place to satiate your sweet tooth? Almond House is the place to be! It not only serves cakes and mithat but is one of the veg restaurants in hyderabad. The place is economical and can be visited for quick bites and satisfying sugar cravings. A perfect amalgamation of North Indian and Mughlai cuisine, Punjab Grills is one of the most popular buffet restaurants in Hyderabad. Reserving your seat is a good option as the place if often packed. 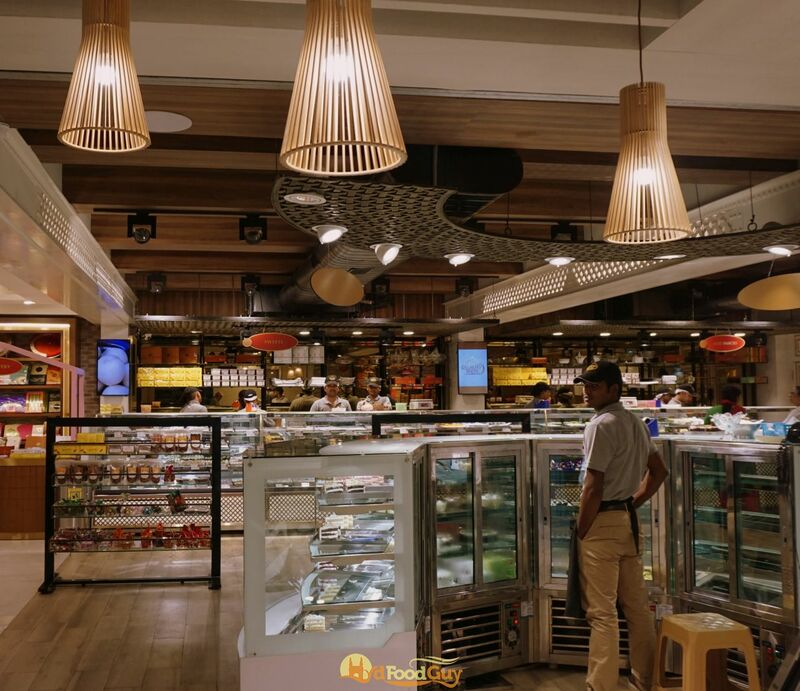 It is a great place for friends and families to dine in and bond over their favorite cuisine, like, chicken biryani, butter chicken and other appetising dishes. 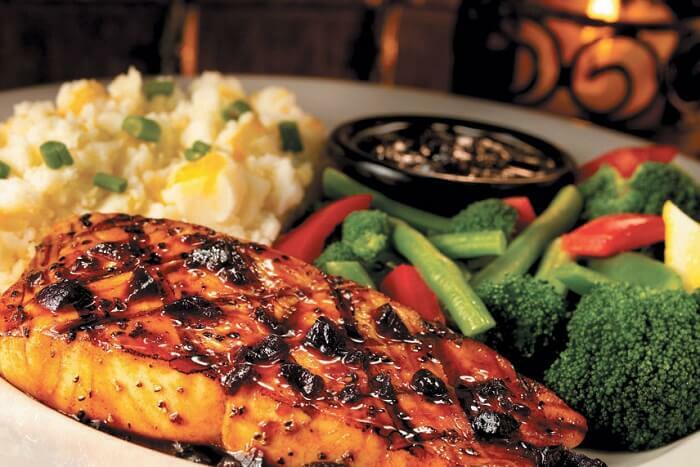 Booking a table in the ‘happy hour’ enables you to get a discount on your favorite dishes. Must Read: 25 Fascinating Places To Visit In Hyderabad In 2019 To Witness The Rich History And Glory! If a complete bar, an area to smoke, wifi and enjoyable night life is what you are craving, visit TGI Fridays, one of the best restaurants in Hyderabad. Their happy hour is 1+1 on drinks and a pitcher of beer with Tostada Chicken Nachos, that will make a boring and tiresome Wednesday evening instantly happy and fulfilling. Appealing decor, comfortable seating with courteous and friendly staff make tatva one of the best restaurants in the city of Hyderabad for a fine-dine experience. Mocktails, paneer tikka, nachos, spring rolls, one has a lot of variety to choose from. 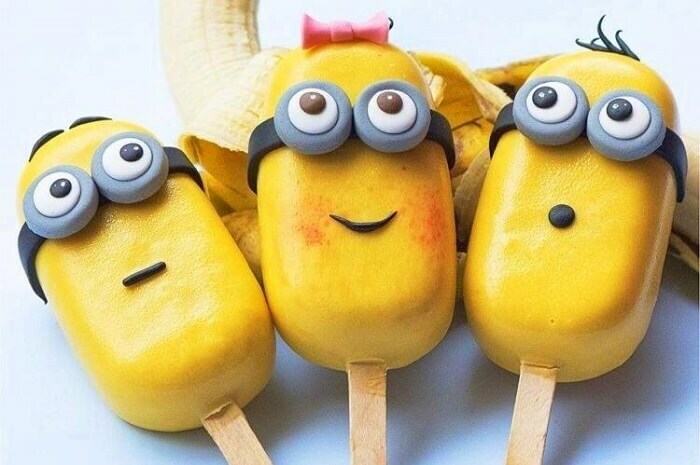 Not only snacks and main course, their desserts are quite in demand as well. The restaurant also provides for valet service and all in all is a great place to dine in. The place is well renowned for its mouth-watering haleem, mutton biryani, Hyderabadi dum biryani, vegetable biryani and butter chicken. The service is prompt and the brilliant and legendary biryani served here makes it one of the top restaurants in Hyderabad. 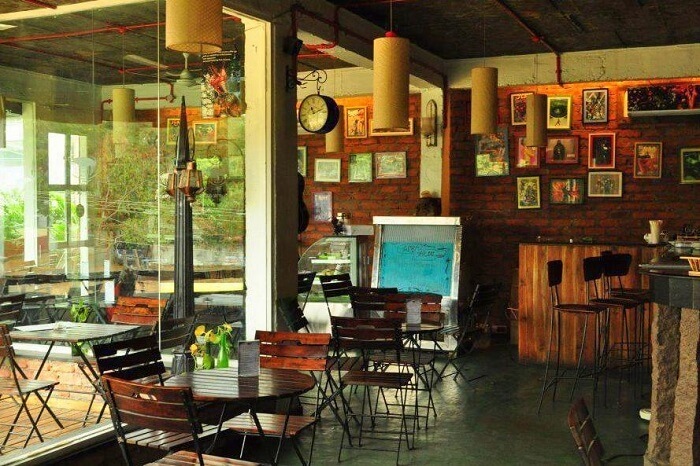 The best part is the place is quite economical and two people can dine in for about INR 600 only! 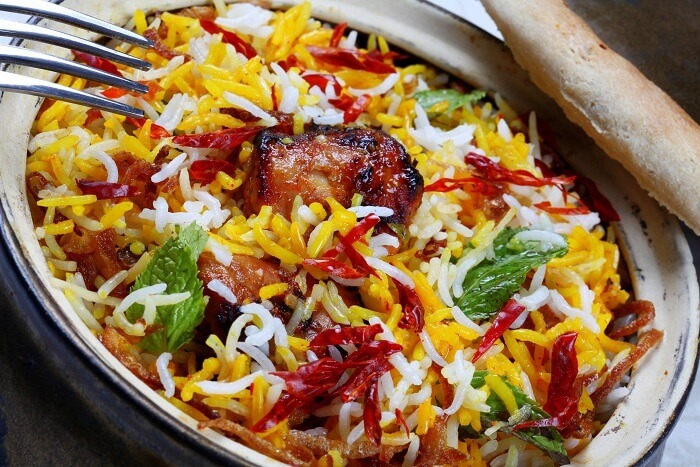 Searching for best restaurants in Hyderabad to savour the authentic taste of biryani? You now know the place to be. 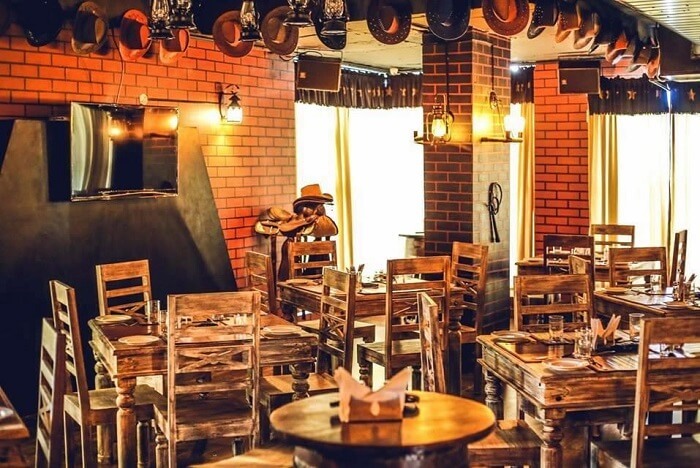 One of the new restaurants in Hyderabad, Cowboys and Angels have a unique and thrilling menu, just like their name. A retro interior with live DJ, the ambiance is nothing but the best! The courteous staff, a huge variety of food and drinks make this place one of the best restaurants in Hyderabad. Specialising in North Indian and Mughlai, some of the delicious dishes of this place are jumbo prawns, Kashmiri naan, malai kofta, chicken curry among many more. The place is wifi enabled and is suitable for buffet or dine-in. 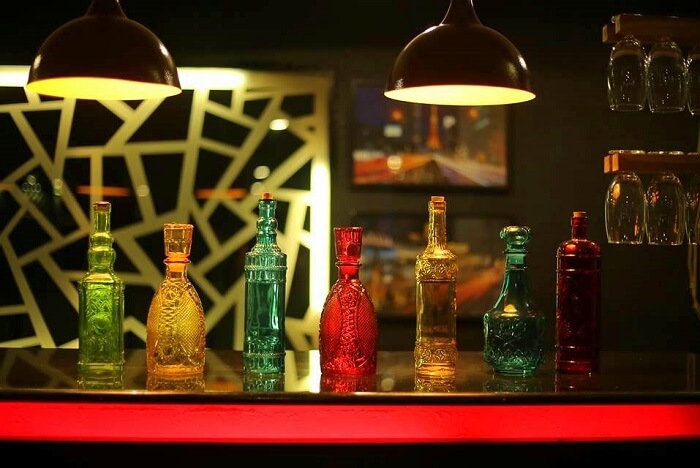 A cozy ambiance and a friendly staff make the place a free zone to bond with your friends and family which makes it one of the famous restaurants in Hyderabad. 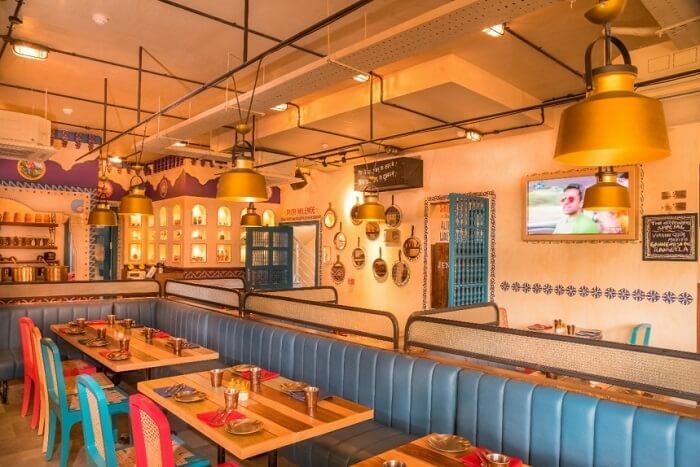 One of the new restaurants in Hyderabad, Smoky Pitara is famous for its veg buffet and Mexican sizzler. Their mouth melting kulchas and naans are what attracts the tourists and locals alike. It is one of the veg restaurants in Hyderabad and is a great place for vegetarians who look for pure-veg restaurants. Mostly there are offers going on here that enables you for discount and free wifi is like the icing on the top! The restaurant specialises in Chinese and Continental dishes and enjoys some rave reviews. The ambiance of the place is cozy and comfortable. 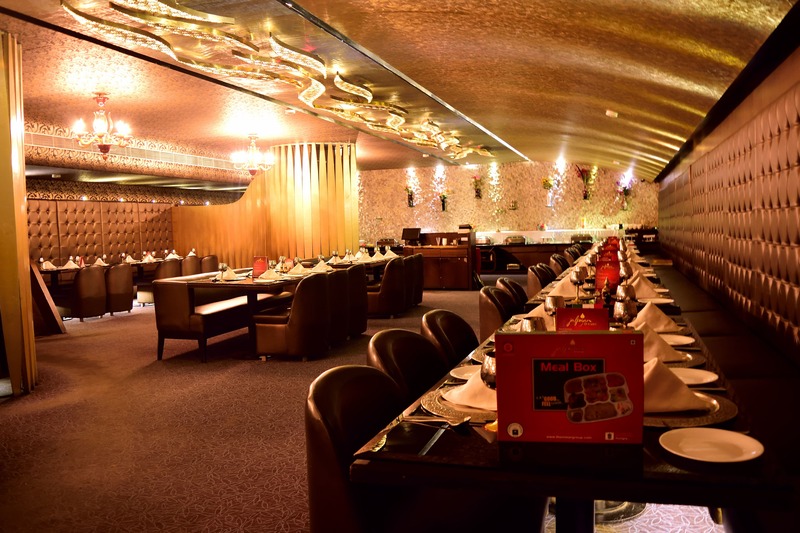 Good service, palatable dishes, and cozy environment makes it one of the top restaurants in Hyderabad. A great place for casual dining, Dhaba Estb 1986 Delhi serves North Indian cuisine with an authentic taste of the North Indian flavors. It is undoubtedly one of the best restaurants in Hyderabad. The place is equipped with live bar counter and music. 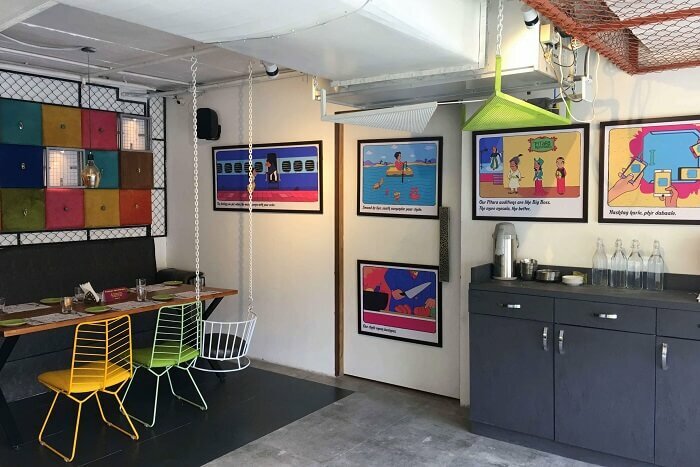 Chicken curry, sarso da saag, tila kulfi, rasmalai are some of the famous dishes served here which never fail to steal the heart and satiate the taste buds. Other than North Indian and dhaba cuisine, one can also savour the delicious street food of Hyderabad at Dhaba Estd 1986 Delhi. 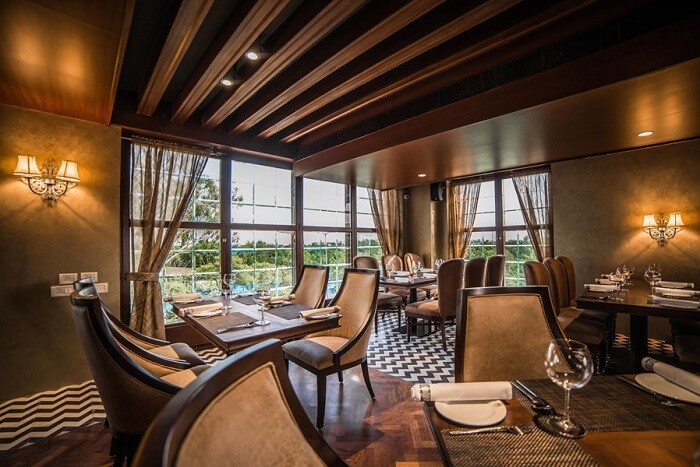 One of the new restaurants in Hyderabad, Flechazo specialises in Mediterranean, Asian and North Indian delicacies. The diners often praise the decor, ambiance, and hospitality of the restaurant. 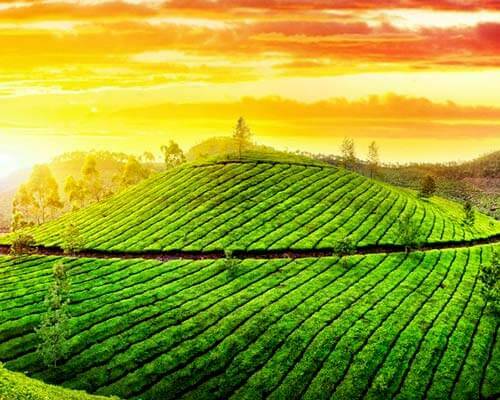 Hence, it has also received good reviews and never fails to leave an impression. The place is wifi enabled with free and valet parking. It is also kid-friendly. All these features make it one of the best eateries in Hyderabad. 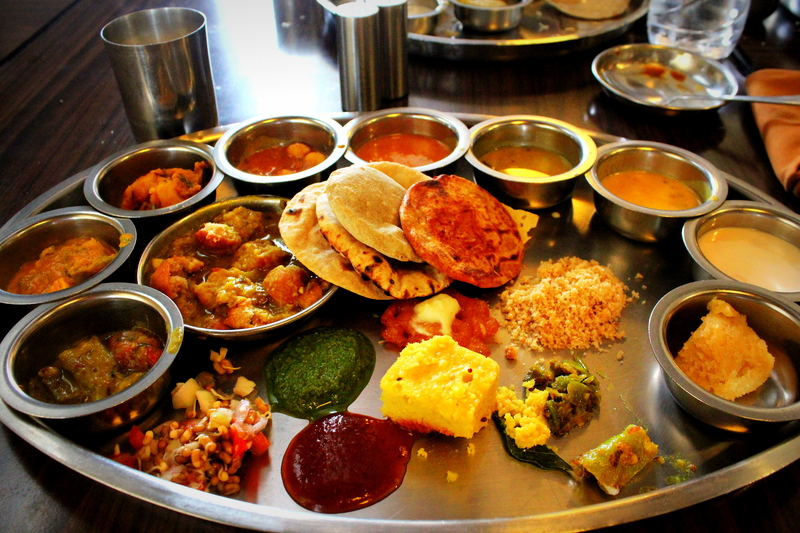 One of the veg restaurants in Hyderabad, Rajasthani Thali Restaurant specialises in Rajasthani and Gujarati cuisine. So, if your calling is kadhi, dal bati churma or dhokla, now you know the place to be. This restaurant is a regional favorite that serves terrific thalis and Jain food. It can be considered one of the best restaurants in Hyderabad for vegetarians, Jains and anyone who would love the Mewari cuisine. A place that would make you forget all the patisseries you have been to, Conçu steals hearts with its Tiramisu, Cheesecake, Macaroon, Carrot Cake, Choux Pastry, Chocolate Eclair, Cappuccino and many more desserts. 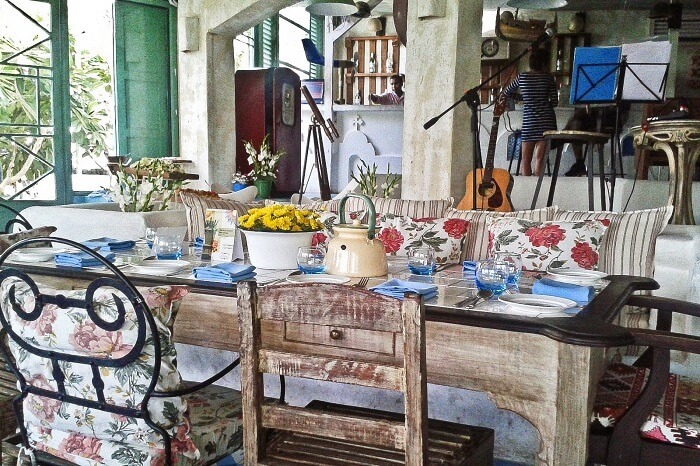 It has an arrangement for outside seating and the ambiance is quite cozy. The place has generated excellent reviews from its diners and happens to one of the top restaurants in Hyderabad. Decorated in a regal fashion, Jalpaan is one of the veg restaurants in Hyderabad with a delightful ambiance and friendly staff. Its mouthwatering Butter Naan, Vegetable Biryani, Chaat, Potli Biryani, Noodles, Gulab Jamun and Paneer Tikka are quite famous and never fails to appeal to the taste buds. Undoubtedly, it is one of the top restaurants in Hyderabad and is known for adding a royal touch to its veg delicacies. 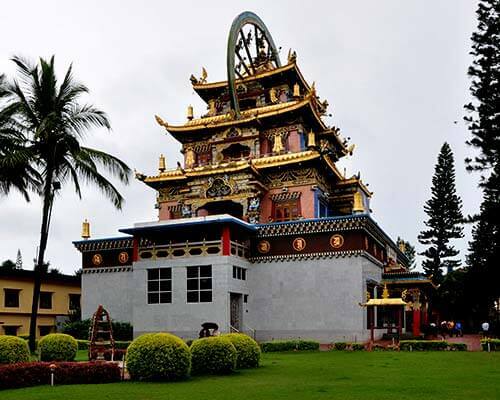 Suggested Read: 8 Picnic Spots In Hyderabad To Have A Gala Time With Friends & Family! The Coffee Cup is the ultimate place to chill with friends and family. Its coffee experience and the breakfast menu is what makes it one of the best restaurants in Hyderabad. The place is equipped with free wifi, live music, outdoor sitting and is even pet-friendly! 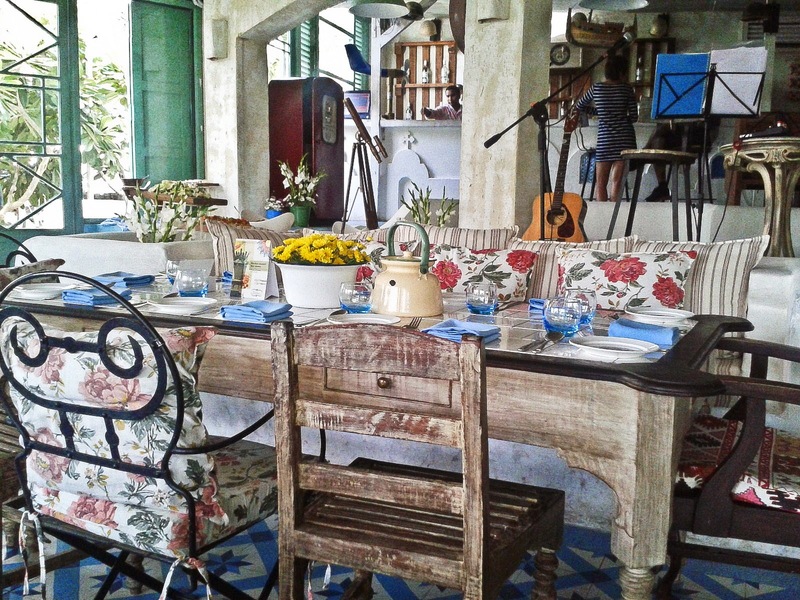 Trying its coffees, mocktails and club sandwiches are a must on the list. One can even play board games sitting outside, adoring the view while enjoying some live music. 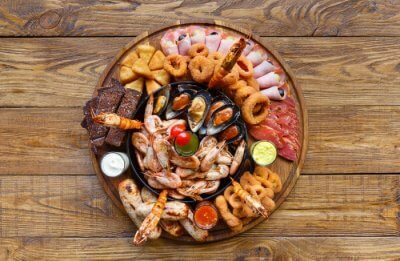 Searching for great buffet restaurants in Hyderabad? Put Sahib’s Barbeque on the list! 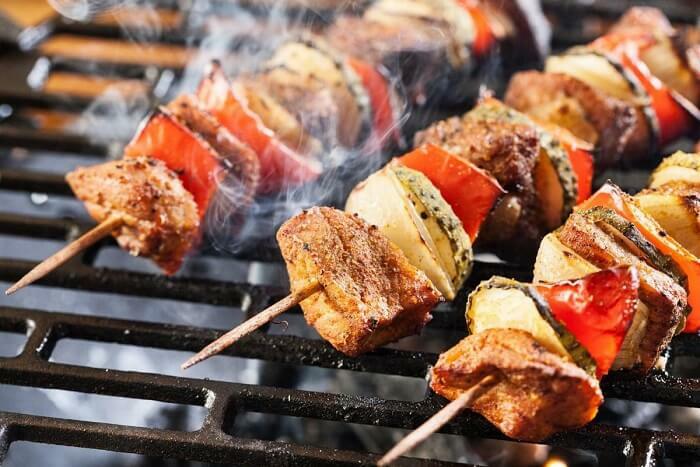 Famous for its Hyderabadi and Awadhi cuisines, Sahib’s Barbeque by Ohri’s delights the foodie in you. It serves delicious Firni, Dum Ka Chicken, Haleem, Mutton Soup, Mutton Seekh, Paan Ice Cream, and Mocktails. Courteous staff, prompt service and live Sufi music with great food make it one of the best restaurants in Hyderabad. A great place to enjoy the nightlife, Olive Bistro has live sports screening, wifi enabled area, a zone for smoking, outdoor sitting and a full bar. Sangria, Ravioli, Tiramisu, Mocktails, Potato Wedges, Risotto, Bruschettas are some of the cuisines to try in the place. The city view from here is quite amazing and the ambiance is lovely which makes all the diners contented. All these features make Olive Bistro one of the best restaurants in Hyderabad. 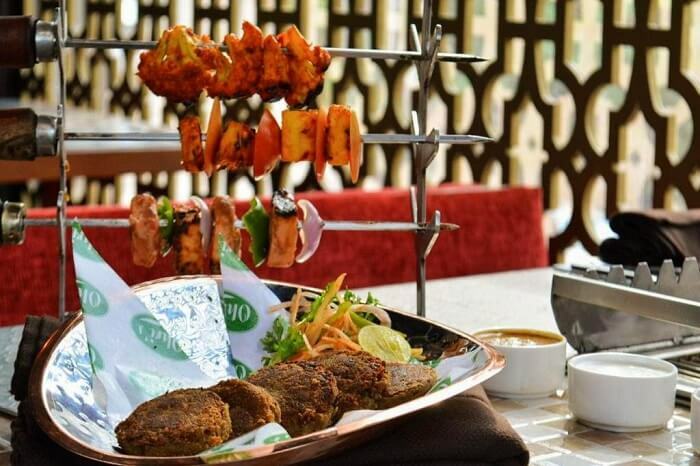 A legendary outlet to savour brilliant biryanis, Paradise is one of the best restaurants in Hyderabad with rooftop dining, valet parking and delicious food. Its Mirchi Salan, Mutton Biryani, Basmati Rice, Chicken Hara Bhara Kebab, Chicken Dum Biryani, Tandoori Chicken, Butter Chicken are what attracts the diners. 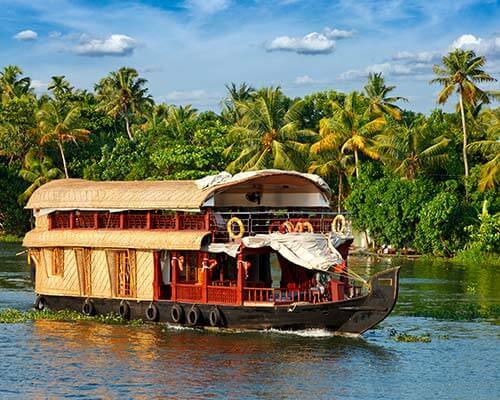 The localities and tourists visit the restaurant alike and their economical prices give the place a major boost. 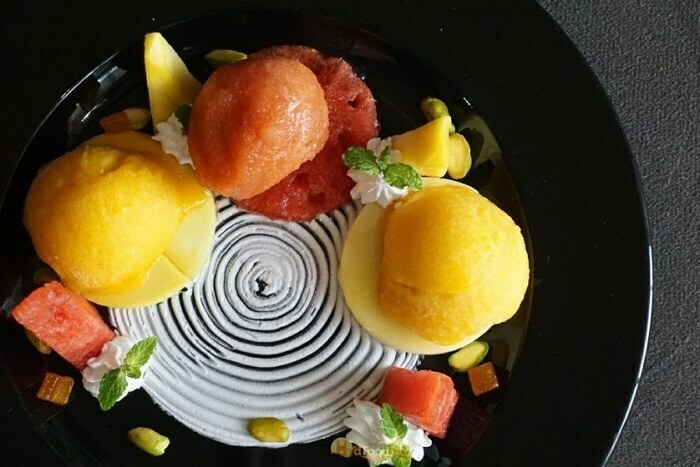 So do not forget to visit Paradise, one of the best restaurants in Hyderabad. Living up to its name, Exotica is a popular restaurant in Hyderabad that serves Mughlai, North Indian and Chinese and has an option of outdoor sitting. The place is equipped with a full bar counter, live sports screening, valet parking, buffet and a lot more. 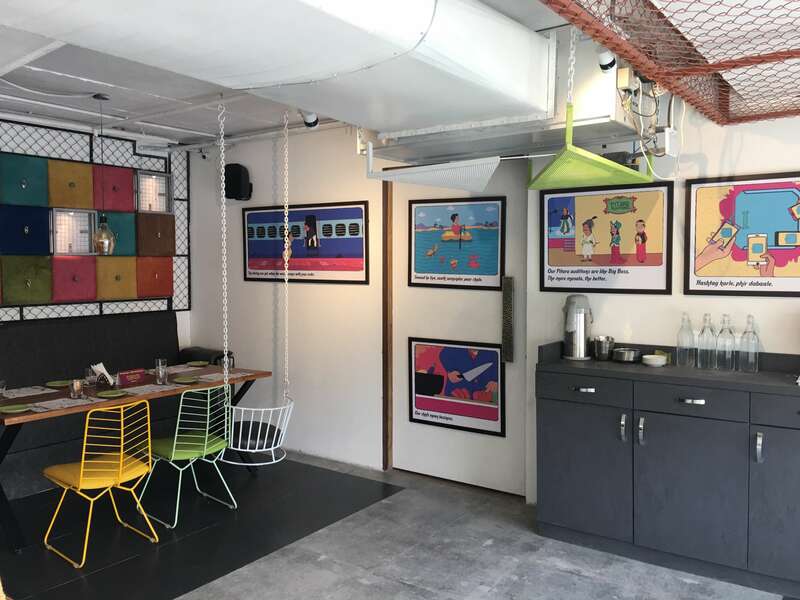 It is undoubtedly one of the best restaurants in Hyderabad and is renowned for Kulfi, Chicken Malai Tikka, Pepper Chicken, Kheer, Chicken Manchow Soup, Mutton Biryani, Pinacolada. 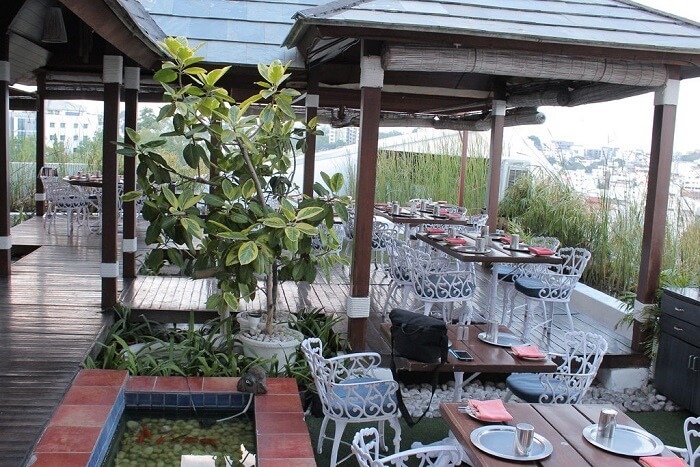 It has courteous and friendly staff and the rooftop ambiance gives the place an edge over. So while you are in the city, searching for best restaurants in Hyderabad, include Exotica in the list. What kinds of cuisines can one find in the restaurants in Hyderabad? A. Hyderabad can be called a paradise for foodies, especially those fond of spicy food! 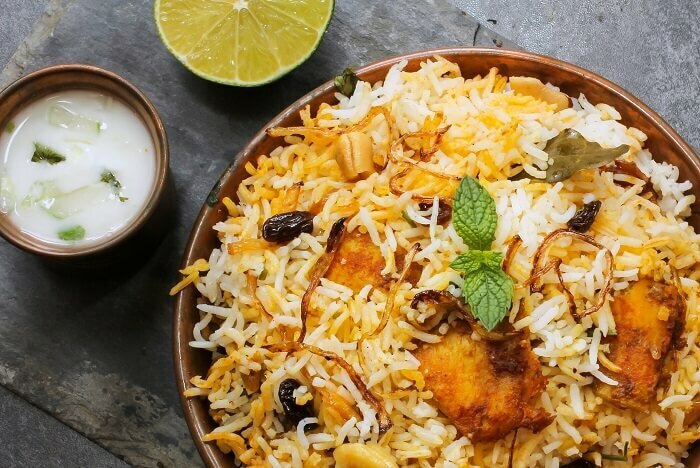 While the most famous dish of Hyderabad is the Biryani, one can find a variety of cuisines like North Indian, Mediterranean, Italian, Continental, and much more in the restaurants in Hyderabad. Which are the vegetarian restaurants in Hyderabad? A. Jalpaan, Rajasthani Thali Restaurant, and Smoky Pitara are some of the best veg restaurants in Hyderabad. Where can one have biryani in Hyderabad? A. Hyderabad has some of the best places to savour the authentic taste of Biryani. The restaurants that serve mouthwatering biryani are Punjab Grill, Cafe Bahar, Jalpaan, and Paradise. 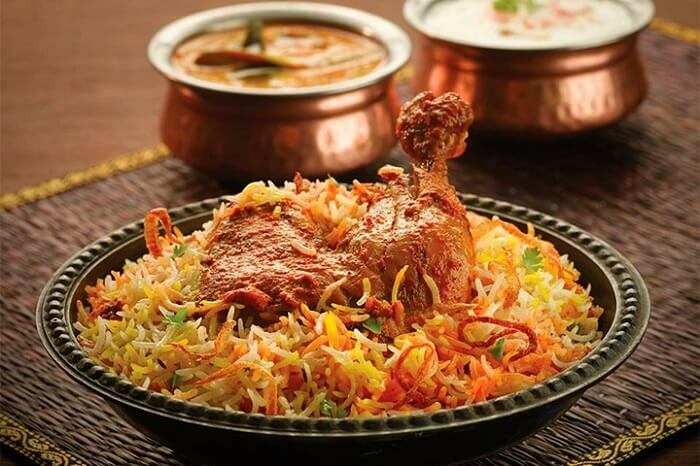 Many hotels and resorts in Hyderabad also serve authentic biryani to satiate the cravings of food lovers. How much does a meal for two cost on an average in Hyderabad? A. A meal for two in Hyderabad can cost anything between INR 600/- to INR 2,000/- depending on the place one picks to dine at. The variety of cuisines Hyderabad offers will turn your whims and fancies into a reality! 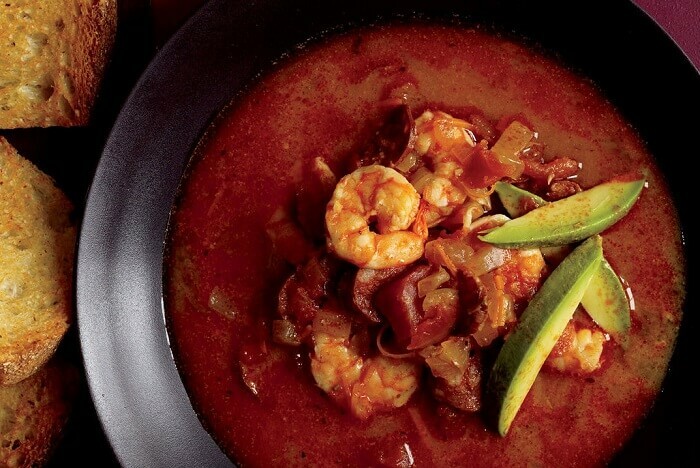 The authentic taste, amicable staff, and awesome ambiance will give you an experience like no other. 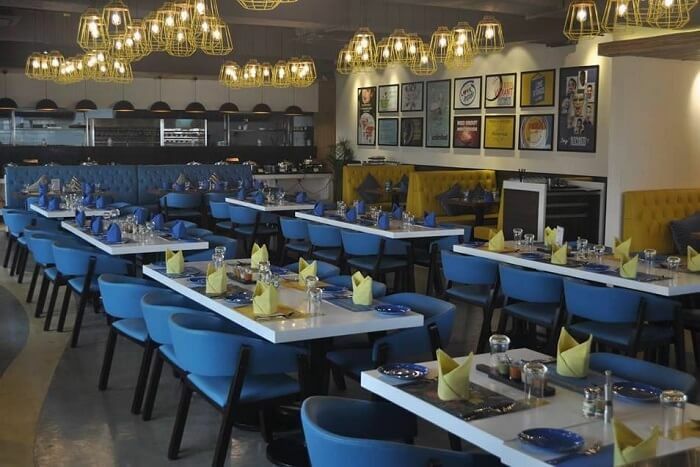 Do visit these best restaurants in Hyderabad for an appetising, wholesome and a sumptuous experience that is bound to leave your taste buds craving for more.